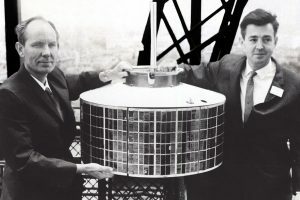 Hudspeth and Rosen (right) show off Syncom 1 in 1963 (Hughes photo). Syncom, powered by solar cells with a launch weight of 78 pounds (including station-keeping fuel), could relay voice, teletype streams, and video. Putting it in the “Clarke orbit” — a position 22,236 miles (35,786 km) above the equator — means it would orbit Earth exactly one time each day, effectively keeping it above the same spot relative to the ground: a geostationary orbit. Any ground station that could “see” the satellite could use it to relay a signal to any other ground station that could “see” it. Rubel arranged for NASA to launch the bird. The first one, launched February 14, 1963, from Cape Canaveral, was lost due to an electronics failure. Syncom 2 was launched July 26, 1963, but didn’t quite get to geostationary orbit. Still, it was stable enough for tests and demonstrations, including of television signals, and was used for the first telephone call from the president to another head of state. 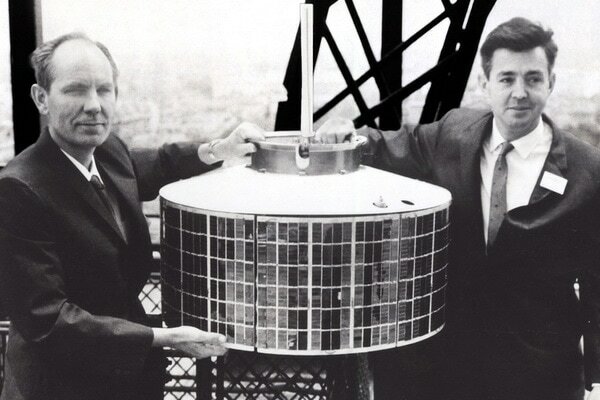 Syncom 3, launched on August 19, 1964, made it to the geostationary orbit, and was the first true geostationary communication satellite; it was used to telecast the 1964 Summer Olympics in Tokyo to the United States. It wasn’t decommissioned until 2012, and is still in orbit. Today, there are about 500 such satellites in that orbit — and indeed, modern ones weigh about 13,000 pounds to have enough capacity to relay credit card authorizations, color HD television, and Internet signals. “Of all the technological breakthroughs made in Los Angeles during the Cold War — the first supersonic jet fighter, the Apollo moon ship, stealth aircraft, the space shuttle, the Blackbird spy plane, the intercontinental ballistic missile system and much else,” the Los Angeles Times reported, “the creation of a communications satellite has had the largest and most enduring cultural, social and economic impact.” Rosen went on to head the science efforts at Hughes Aircraft’s space and communications group. Rosen retired in 1992, but stayed on as a consultant for Boeing’s satellite group, which had bought out Hughes. “He was active until the end,” said his wife: Rosen died at home January 30, at 90.